Well another episode in and we’re finally splitting the 1970’s with the 1770’s. So let’s start with the ‘present’. We keep going back and forth on their story but the one thing we can definitely agree on is that it doesn’t end on a sweeping romantic moment. **SPOILER** for all those who have not read the books, it never really does with these two. While we’re still waiting for that spark that makes you want to root for them as a couple, there are some moments in this episode that help us warm up to the idea a bit more. The car ride to the Highland Games has some fun moments where they’re playing games and sharing a milkshake. When they’re dancing a jig together and having their portrait drawn. When they’re sharing a drink while starting at the creepy stuffed deer head. Even when they’re having the argument right after Roger declares his love. But there still seems to be a missing chemistry and we’re not sure if that’s a deliberate choice of the show, or if there is a missing connection somewhere that would make their scenes together crackle more. Richard Rankin plays Roger to a tee. You love him, get annoyed with him, love him, hate him and then love him again. He’s so easy going most of the time that it’s a shock when his boorish and stubborn nature comes out, and Rankin plays that wonderfully. Sophie Skelton is doing a good job but Bree is a hard character to warm up to. Like Claire there is an independent spirit about her that you love, but at the same time you know you’ll never really be close friends with her. Bree is often at odds with characters we love so she’s not the easiest to like. It’s hard to tell if we’re not warming up to her on the show because we know this about her from the books or if Sophie really hasn’t been given a chance yet to make Bree shine as her own character. We’ve seen her in terms of her interactions with other characters, but we haven’t been given a moment to see her on her own. Hopefully we’ll get those scenes soon. As book readers all we can say about these two is…brace yourselves. For now, let’s leave them to the future and travel to the past. So much in this episode for book readers to “Oh”… “OH”…about but we won’t spoil it for everyone who just watches the show. Ok, we’ll try not to spoil too much. Jamie and Claire are leaving River Run post-haste. We talked about the slavery issue with the last episode so we won’t go there again, but Jamie has a speech a little further into the episode that gives another great reason as to why he and Claire don’t belong at River Run. Namely, he’s lived most of his life fighting against the very things that type of life engenders. So while he’s leaving the plantation for his family, he’s also leaving for himself. We’ll miss Jocasta’s wardrobe, though. We’re really happy Jamie has relented and is letting Ian stay in America but when Jamie agrees to let Ian go off with John Quincy Meyers to do some trading with Native Americans in a land none of them (outside of Meyers) really know…*face palm* moment. Seriously, Jamie and Claire waffle between moments of deep insight, to moments of complete and utter naiveté. You think they’d have learned by now. For all the realism the show tries to bring to the past, there are those moments of the supernatural that pervade, namely around Claire’s ability to jump time. The scene with the Native American ghost was quite chilling and the effects were well done. It took us a few moments to realize what was going on when he kept disappearing with the lightning. Yes, we said ghost. Although, given the fact that this apparition may have removed Claire’s boots and put them in a spot for Jamie to find, technically it’s probably more of a poltergeist. Yikes! And while walking along, Claire and Jamie come across a gorgeous spot of land (because we may have ‘left’ Scotland in the show, but we have not left behind breathtaking vistas) and – wait for it book readers…wait for it – Fraser’s Ridge is founded. This is what we’ve all been waiting for right? A place that finally, and completely, belongs to Jamie and Claire, and the nucleus for most of the action for the next few books. Now it begins! Omens: the lightning hitting the tree, Claire finding the skull and gemstone, and the strawberries upon the land where Jamie and Claire will put down roots. The book Bree gives Richard on the history of the Scots in North Carolina. And in case any book readers haven’t happy danced enough…FRASER’S RIDGE!!!! Having been led by providence to Fraser’s Ridge, Jamie, Claire and Young Ian begin to build a home in the Blue Ridge Mountains. But their efforts are stymied by unwelcoming neighbors and a bloodthirsty bear that ravages their settlement. In the 20th century, Roger tries to reconnect with Brianna by searching for proof that her parents found each other in the past. What did you all think? Book readers, how are you feeling about the changes so far? Those who just watch and love the show – how are you feeling about the show’s change of location to Pre-Revolutionary America? Outlander Recap and Reflection! Surprises, tears and making new enemies! Outlander is back! 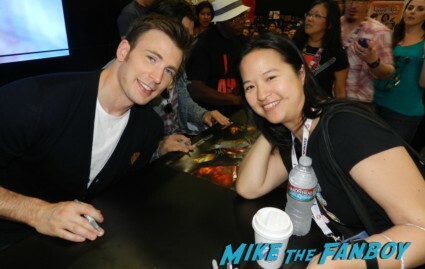 Erica Meets Captain America Himself Chris Evans! Along With The Cast Of The Winter Soldier! Samuel L. Jackson! Emily VanCamp! Anthony Mackie! Frank Grillo! Autographs! And More! TV Heartbeat! IFC’s Babylon! Ron Moore’s Helix! Tina Fey And Amy Poehler At The Golden Globes! Fox’s Gotham! And More!